Spider-Man is the iconic Marvel superhero. He’s courageous, responsible, relatable and talks way too much in a fight. His adventures define Marvel’s identity and the escapades of all of its other supers. It’s saddening that recent adaptions of the webslinger to the big screen failed to capture this zeal. “The Amazing Spider-Man 2” and “Spider-Man 3” embarrassed our hero; one by bloat, the other with excessive dance. “Homecoming” has much to make up for and even more to catch up on. Can Jon Watts successfully introduce yet another new Spider-Man to the world? heroism become his comfort and pleasure; they are an exhilarating break from normalcy and help to cope with his teenage angst. Saving the world with the Avengers is now Peter’s dream. He longs to epitomize their energy and participate in something greater. Iron Man (Robert Downey Jr.) admonishes Peter, reminding him, once again, of his youth and unreadiness. Tony Stark’s hands-off approach to mentoring and and accompanying dismissal only intensifies Peter’s desires; he has so much more to prove. Peter’s impatience puts him in a precarious position. He juggles supervillain fights, Stark’s approval and his academic and social life. Holland plays the most youthful and inexperienced iteration of Spider-Man yet. He has trouble prioritizing. 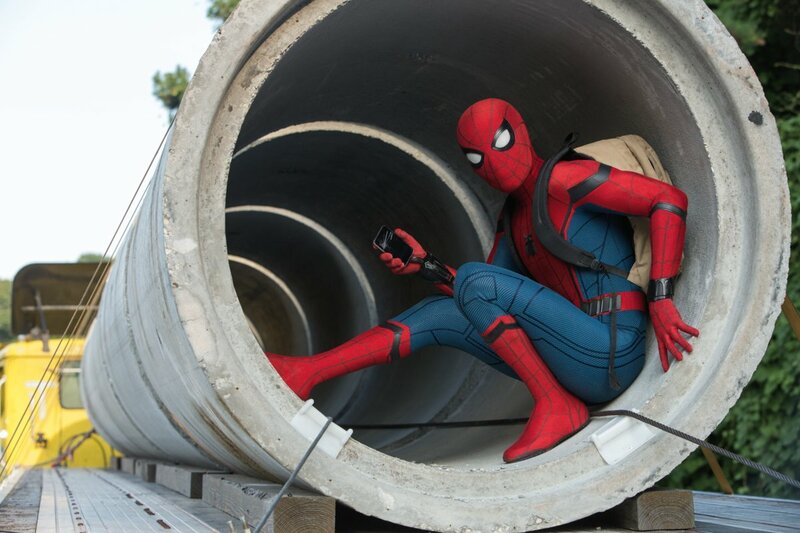 Peter’s goal to become an Avenger disrupts his normal life, but being a good student endangers the world. Hacking advanced technology, decathlon competitions, homecoming dates and combating alien weaponry crowd his schedule. An adolescent like himself will not always make the right decisions, but Peter learns from his mistakes and matures. This narrative is backed by the consistently high quality of every Marvel film. The cast is composed of quirky, colorful characters. Peter’s best friend, Ned (Jacob Batalon), pesters him with fanboyism and aids him in his misadventures. The green-eyed Adrian Toomes (Michael Keaton) leads a posse of scavengers to profit off of the sale of destructive alien technology. The CGI is as gripping and explosive as ever; Spider-Man slings himself across the rooftops of Queens, a ferry ruptures in half and capsizes and the Vulture’s aerial-suit-blasts devastating lasers. It all combines into a quick but enjoyable package. The total show is so rapid that it seems that more time could have been devoted to character development. Then again, it’s hard to improve on excellence. Finally, Marvel has produced a reboot worthy of carrying Spider-Man’s name. The film fittingly acknowledges the difficulties of bringing back Marvel’s biggest star. It answers any doubts exceptionally; it has quality performances, trademark action sequences and a metaphorical narrative of the studio’s maturity. We should look forward to Holland’s return in subsequent films. Welcome back, Webhead!